You might have noticed I missed last week's fashion nail art post for the 40 Great Nail Art Ideas challenge, life just got on top of me! But I'm back with some nail art inspired by ModCloth's latest romantic road trip looks for Spring. Even though Summer is only just over here in Australia I've got a big trip planned for April/May and will be soaking up the gorgeous European spring very soon! These two pieces both look like holiday must haves - a roomy bag for carrying all the necessities and a versatile tunic for a casual day trip outfit. I love the simple combination of colour and grey that unites both items, and they both make for quick, easy and cute nail art. First up, inspired by the chic colour blocked Results May Carry Bag is a mint and grey french with two luscious cremes from Powder Perfect - Legend Says* and Crenellations*. Now we get dotty with inspiration from the Medium Format Memory Tunic, using the gorgeous grey jelly Knight in Shining Armour from Shades of Phoenix, stamped with Essence Have Fun using MoYou plate Holy Shapes 09. Are you looking forward to a colourful spring (or cooler autumn, for my fellow southern hemisphere pals)? 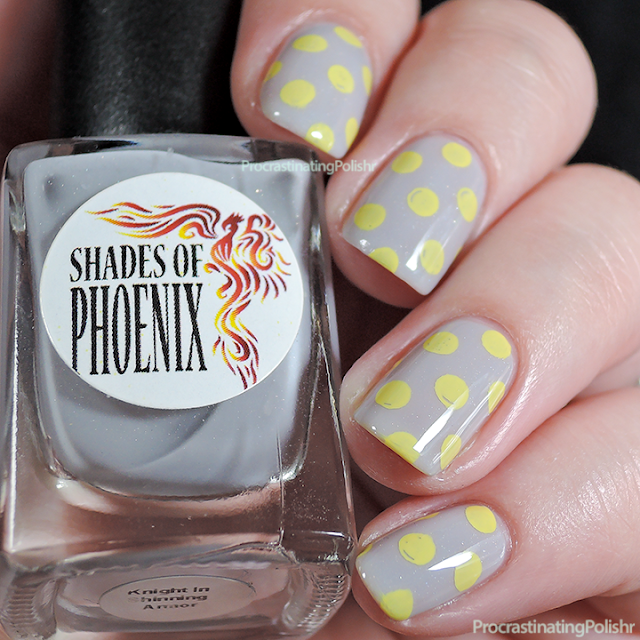 You can check out ModCloth's spring range, or at the very least find some great nail art inspiration by clicking the banner below! ^This post contains affiliate links. Actions you take from clicking links within this post may yield commissions for procrastinatingpolishr.com - refer to my Disclosure page for more information. Products marked * were provided as press samples.